Under beautiful blue skies yesterday in Gulfport, Mississippi, David Evans and Associates, Inc. commissioned its new 82-foot hydrographic survey and scientific vessel Blake. 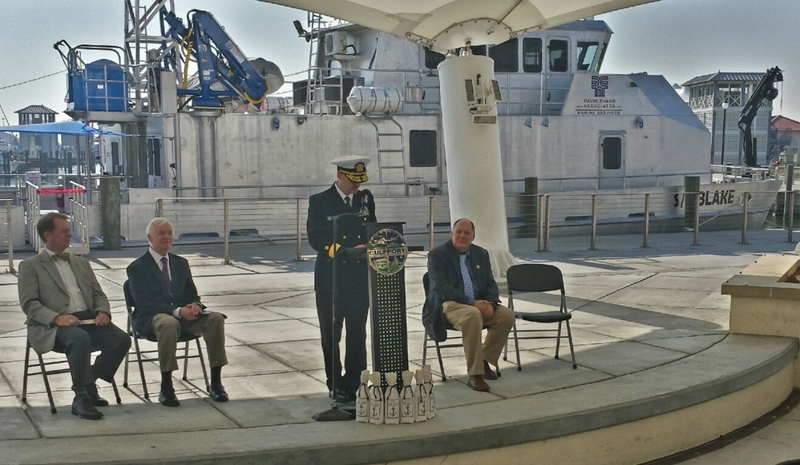 Rear Admiral Gerd Glang, Coast Survey’s director, welcomed the addition to the nation’s hydrographic surveying assets. DEA is under contract to NOAA to provide critical hydrographic data for updating the nation’s nautical charts. Speaking at the Blake‘s commissioning ceremony were (left to right) Mayor William Gardner Hewes, U.S. Senator Thad Cochran, Rear Admiral Gerd Glang, and Jon Dasler, director of Marine Services, David Evans and Associates, Inc. Photo by Tim Osborn, NOAA. Glang pointed out that, for the past 15 years, NOAA has fulfilled its charting mission through a successful partnership with private sector surveying firms. U.S. Senator Thad Cochran, who did the honor of breaking a Champagne bottle across the Blake‘s bow, spoke of the vessel’s value to the nation. The custom-built Blake is an aluminum catamaran. The vessel is designed to be a stable, efficient and cost-effective survey platform with wave-piercing bows, tier-3 diesel engines, twin 50-kilowatt generators, and a full suite of state-of-the-art survey instrumentation. Built by Geo Shipyard, Inc. in New Iberia, Louisiana, the new vessel will complement the firm’s national operations and expand DEA’s hydrographic and geophysical survey and marine science capabilities in the Gulf of Mexico and beyond. The new vessel is named after the 19th century U.S. Coast and Geodetic Survey steamer George S. Blake, an oceanographic and hydrographic vessel renowned for testing innovative technologies such as the Pillsbury current meter, which was the first deep-sea current meter, and the Sigbee deep-sea sounding machine. The federal Blake was commissioned in 1874, operated in the Gulf of Maine, the Gulf of Mexico, and the Caribbean Sea. The Blake’s accomplishments are documented in Three Cruises of the BLAKE, by Alexander Agassiz. The vessel had numerous seafloor features named after her, including the Blake Abyssal Plain, Blake Plateau, Blake Canyon and Blake Ridge, all of which are off the southeastern coast of the U.S. Noting the advanced technologies onboard the S/V Blake, that were not even imagined 140 years ago when the USC&GS steamer Blake did it’s innovative work, Glang congratulated the firm on its significant contribution to the survey mission. For more, see this news report from WLOX TV. Congratulations to David Evans & Associates! A significant platform acquisition that will enhance the already outstanding capabilities of one of NOAA’s hard-working partners.